Originally, there were four parishes in the grouping – since that time Immaculate Conception has closed. Sacred Heart is scheduled to close this summer, though that’s still somewhat up in the air, as the bishop is reexamining that situation. When a parish closes, you’re dealing with a lot of emotions from the parishioners there. So it requires special pastoral care: being there for them, dealing with families who have been in that parish for several generations. I will say that Fr. Mark (Peres, C.PP.S., the pastor) is doing an exceptional job with this. He came to the position right in the middle of this. It was certainly a challenge for him, and he’s doing a great job. Another challenge for me is my language skills. There are many people who are Latinos at Sacred Heart—and unfortunately, Spanish is not my second language. I would really like to learn Spanish, but I don’t seem to have the gift for foreign languages. The people. For 42 years, I worked with youth at a Boys & Girls Club in Chicago and really enjoyed it. Since I’ve become a deacon, I’m dealing a lot more with the other end of the spectrum: seniors. It’s a world of difference for me. I’m continuing in the hospital ministry at St. Catherine’s in East Chicago that I was doing before my ordination, and I’m now doing home visits to the sick and infirm on the first Friday of every month. I love it because you look into the eyes of an older person, and you can see the burning intensity of their faith. You see the love for God in their eyes—and it grabs you. The continuing generosity and support I’ve received from our parish and the whole faith community. When I was ordained, I was overwhelmed by the number of cards and gifts that I received. The same thing happened at Christmas, and I certainly wasn’t expecting it! All this stuff was in my mailbox—I wasn’t even looking for it. I didn’t even see it until January! As I was writing thank-you notes, I had to apologize for that. More than the gifts and cards, which were nice, I appreciate the ongoing positive comments. I was nervous about preaching, but people have been very kind. I preached on November 1, All Saint’s Day, and I’ve preached on some Sundays and other holy days. Fr. Mark also lets me preach at daily Mass on Tuesdays and Fridays. I enjoy preaching. When you’re writing homilies, some come out so easily. Some are like pulling teeth. I remember one homily where there were three directions I wanted to go, and none of them seemed to work. I tore up the first draft, and the second one wasn’t any good either. Finally I struggled through a third draft. Afterward, somebody told me how good it was—that is was a message they needed to hear. God surprises you. I find that the best way for me to preach is to consider any questions that I might have, then dig through my resources and try to find some answers. I figure there may be a few other people out there who are wondering about the same thing. My simple answer is today. I love every day. I look forward to it, it’s a new day for me. I get up and tell God, “Wherever you call me, that’s what I’m ready to do.” I have my joys and challenges, surprises and failures—but I just love it all. My favorite day is the one I’m in right now. But if you’re talking about a special moment, that came for me at the 11 p.m. Christmas Eve Mass at St. John. You’ll remember that Christmas fell on a Sunday. We had the fourth week of Advent that morning. 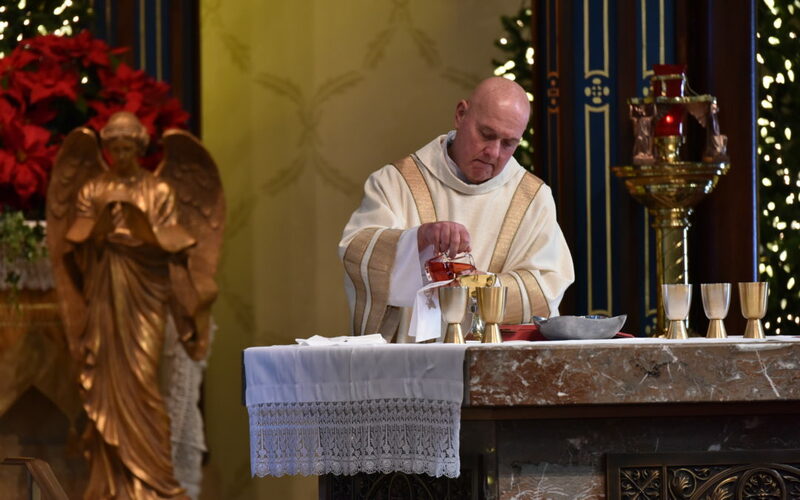 I was at two Masses that morning, followed by Christmas Eve Mass at Sacred Heart, and then I had to get back to St. John for what we call midnight Mass, even though it starts at 11 p.m.
Driving over there, I was tired. I got there a little before 10 p.m. The lights in the church were mostly off. Fr. Mark arrived too, and we saw that everything was all set up for Mass. The choir does an hour of singing before the Mass, so Fr. Mark and I both sat down in the chairs where the servers sit, and just listened to the music. It was one of those moments when you are full of the Holy Spirit. It was like I was back at St. Mary of the Angels Church in Green Bay, Wisc., where I grew up. When I was a kid, my father sang in the choir, and hearing him sing on Christmas Eve was always a really special night for me. God’s got a plan for all of us. Just when you think you know it, you find out you still don’t know it all. Before I started in ministry at St. Catherine, I had been hesitant about doing hospital ministry because of the idea of walking into a hospital room not knowing what you’re going to encounter. But now I’ve come to enjoy it. I drive over there, knowing that I’ll visit people in 40 to 50 rooms, distributing communion, ministering to the people if they need it. Some people say they don’t want communion, so we say a prayer together or I tell them I’ll pray for them in chapel. Some rooms, I’m in and out in three or four minutes. In other rooms, the people want to talk, so I’ll talk with them. Or mainly listen. I’m going tomorrow to Michigan State Prison and doing the orientation to get what I need to gain access. So it looks like I might be starting prison ministry. That’s where I’m headed. God’s got me in the boat and he’s steering. When I was nearing ordination and thinking about being up at the altar during Mass, I was hesitant at first. I felt I didn’t belong up there. I didn’t want people to think, “Look at that guy, who does he think he is?” But I’ve come to love it not simply because I’m up there, but because it brings me closer to God. He’s right there on that altar and I’m so close to him. I really appreciate that. It’s not about being up in front of people. It’s the opportunity to be close to God. I had all my questions about it, all my reasons for not becoming a deacon. But it seems so wonderful now. I really enjoy it. God certainly is leading me through all this. He has been very generous with me. He has given me four significant people who made a big difference to me. All four are women. First is my wife, Cynthia; she’s not even Catholic, and she has opened the door for me and encourages me. The second is a parishioner; I marvel at the way she lives her life. The third is the one who told me that I should be in the lay pastoral ministry program. The fourth is my spiritual director. She has allowed me to really look at myself, and realize things that I hadn’t even considered. She keeps pushing me in a very gentle way.